...that Cortana had an older "sister" AI named Kalmiya? ...that the Halos destroyed all Precursor artifacts in the galaxy? ...that Plasma Rifles are much more effective against Flood combat forms in Halo 3 than in any other game? ...that Derelict and Boarding Action are the first two maps set in space? This article does not meet the wiki's general standards and/or standards on layouts. You can help by cleaning this article. Special Operations is an Unggoy rank in the Covenant military. Unggoy of this rank are part of the Special Operations division of the Covenant. Normally, Unggoy are poorly trained for combat and are usually deployed in massive numbers as cannon fodder. However, if they are given proper training they can acquire specialized roles and provide excellent support to Special Operations teams. Often standard infantry Unggoy find themselves promoted to this rank when their commanding Sangheili is folded into the Special Operations division. Generally tougher, smarter, and certainly more aggressive than their lesser brethren, Special Operations Unggoy are often deployed with Special Operations Sangheili team leaders and specialized equipment and sometimes will be lead by Unggoy Ultras. These resilient, loyal, and dangerous operatives are not to be underestimated under any circumstances. If a Special Operations Grunt's leading Sangheili is killed, rather than panicking and fleeing, they will often seek revenge, finding cover and sending plasma grenades and plasma bolts accurately at the opponent who killed the Sangheili. They are also much more accurate than their counterparts, and their armor is much more resilient to damage than other Unggoy Ranks. Special Operations Unggoy were widely used by the Covenant during its genocidal campaign against humanity. Often serving under their Sangheili counterparts, these highly trained Unggoy were capable of being deployed to undertake the most perilous of missions. During the pre-invasion of the human colony world of Reach, the Fleet of Valiant Prudence discreetly deployed a team of Sangheili Zealots to disable one of the planet's communication outposts at Visegrád. A squad of Special Operations Unggoy were present deep within the facility by the time SPARTAN-III NOBLE Team responded to the sabotage. These Unggoy were protecting one of the Zealots as he worked on a junction. When Jorge-052 and SPARTAN-B312 entered the area, the Special Operations Unggoy were defeated by the humans, with the Zealot falling shortly afterwards. When the Covenant began their invasion of Reach, they established various strongholds across the Szurdok Ridge at Ütközet, including one in a BXR Mining Corporation facility. When the UNSC attacked these strongholds on the morning of August 12, a group of Special Operations Unggoy were present in the BXR facility, along with a Sangheili Zealot and other Covenant forces. These forces were defeated by a UNSC force lead by Kat-B320 and SPARTAN-B312, who passed through their facility in order to find and destroy a Covenant AA gun. Towards the end of the battle, during the Battle of Asźod, a squad of Special Operations Unggoy ignited plasma grenades in a suicidal attempt to stop Spartans Emile-A239 and Noble Six but failed in their attack. Several more were present guarding the "Onager" mass driver from being manned by human forces along with a group of Sangheili Zealots and a Field Marshal. They were unable to stop Noble Six, who eliminated the Covenant force and took control of the mass driver, destroying untold numbers of Banshees and Phantoms as well as crippling a CCS-class battlecruiser when it attempted to open fire on the departing Pillar of Autumn. During the later stages of the Battle of Installation 04, the Flood parasite managed to escape containment and soon spread across the surface of the installation. At least one Covenant Spirit was captured by the Flood. They used the dropship to board the agricultural support ship Infinite Succor unbeknownst to the rest of the fleet. When the ship lost communication with the rest of the fleet, Supreme Commander Thel 'Vadamee assembled a team of Special Operations Sangheili and Special Operations Unggoy lead by Commander Rtas 'Vadumee to retake the ship from what was assumed to be human forces at that point. During the events aboard the Infinite Succor, all members of the Special Operations team were killed or infected by the Flood, leaving 'Vadumee as the sole survivor. The Flood were able to overwhelm the cruiser Truth and Reconciliation which had been holding position near the surface of the installation. A strike team consisting of Special Operations Sangheili and Unggoy were sent in to neutralize the Flood and prepare the ship for immediate departure. Over the course of the battle, many Spirit dropships and Banshees were seen deploying Special Operations forces into the cruiser by SPARTAN John-117. By the time the remaining human forces on the ring stormed the Truth and Reconciliation, the strike team and the Flood had managed to nearly wipe each other out. Towards the close of the battle, a contingent of Special Operations forces consisting of Sangheili and Unggoy were present on board the crashed Pillar of Autumn, where they battled against the Flood as well as Sentinel forces. Shortly after the Battle of Installation 04, the Prophets sent a team of Special Operations forces consisting of Sangheili and Unggoy to a gas mine in the atmosphere of Threshold to kill Sesa 'Refumee and the heretic forces under his command. Lead by Rtas 'Vadum and newly-adorned Arbiter Thel 'Vadam, the team was able to complete their mission despite the unexpected entrance of the Flood into the battle. While many Special Operations Unggoy remained loyal to the Sangheili when they were cast out of the Covenant, many more remained loyal to the Covenant, now under the command of the Jiralhanae. These Special Operations Unggoy would continue to fight on behalf of the hegemony during the latter stages of the Battle of Earth, as well as the Battle of Installation 00. Special Operations Unggoy are denoted by their signature jet-black armor, which matches the black armor of their Sangheili commanders. In Halo 2, they are occasionally equipped with active camouflage. They are only hard to kill when they are carrying a Needler, since the Needler does not generate a glow unlike Covenant plasma weapons. They are only called in during special combat situations, and hold a unique amount of respect for a member of their race. They are highly trained and only commanded by the skilled Special Operations Sangheili. Unlike most Unggoy, they are vehicle drivers. They have slightly more health than Unggoy Heavies but about the same as Ultras. Unggoy within the Special Operation Division are given ranks, similar to the system utilized by the mainline Covenant military. They have no distinguishable differences between their combat harnesses, other than differing colors; select Special Operations Unggoy wear white armor, rather than the normal black or dark purple. Special Operations Unggoy almost never panic during combat, as the Minor and Unggoy Majors almost always do when their leader is killed. They often wield Needlers, fuel rod guns, plasma grenades, plasma launchers and occasionally plasma pistols. The biggest concern of facing a Special Operations Unggoy, however, is that a Special Operations Sangheili is more than likely nearby. Unggoy of this rank are not to be underestimated, though. Sometimes if the highest ranking Sangheili is down, the Special Operations Unggoy will run, but to better cover and will usually send out deadly and accurate barrages of plasma grenades. This can be fatal on the higher difficulties. Like earlier, they are not to be trifled with and must be taken down with precision and speed to allow the player to survive the Legendary difficulty. Being quite skilled fighters in comparison to the Minor and Major Unggoy and therefore not having to rely on large numbers, they usually move in teams of two or three, with one Spec Ops Unggoy wielding a fuel rod gun while the others cover him with plasma pistols and needlers. In Halo: Combat Evolved, it is best to target the one holding a Fuel Rod Gun as his teammates may be killed when it explodes, and also since the Unggoy fires the fuel rod gun very rapidly which can prove fatal even on Easy difficulty. In Halo 2, throwing grenades at them can be effective, especially when sticking them with plasma grenades. Special Operations Unggoy are faster than average Unggoy soldiers and sometimes it takes multiple melee attacks to kill them. Special Operations Unggoy are seen more frequently in Halo 2 than in Halo: Combat Evolved. Special Operations Unggoy in Halo: Combat Evolved are similar to their Heretic "brothers". They are not deployed as cannon fodder, use either needlers or fuel rod guns, only cower in the presence of the Flood, and work alongside similar-ranking Sangheili. 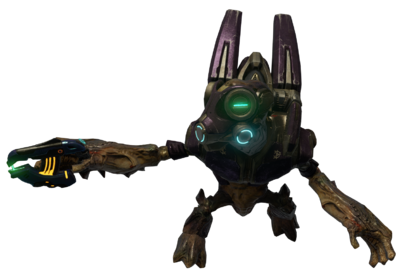 Every Special Operations Unggoy in Halo: Combat Evolved has either a Needler or a fuel rod gun, as per their status as elite infantry. The only exception to this is an Easter egg, the "Thirsty Grunt", who has a plasma pistol. In the Halo 2 level The Oracle's opening cinematic, the Unggoy that file in after the Sangheili have no weapons, but they have plasma pistols when gameplay starts. Many players have mistaken the Special Operations Unggoy in Halo 3 for Ultras, due to their lighter coloured armour, but Bungie.net states that they are indeed Special Operations. Urk nicknamed the Special Operations Unggoy of Halo: Reach "Starscreams" because of the spires on their shoulders. A Special Operations Unggoy wielding a Type-33 needler in Halo: Combat Evolved. A Special Operations Unggoy in Halo: Combat Evolved wielding a fuel rod gun. Closeup of a Special Operations Unggoy in Halo 2. A Special Operations Unggoy in Halo 2. A Special Operations Unggoy in Halo 3. A Special Operations Unggoy in Halo: Reach. A Special Operations Unggoy in Halo: Combat Evolved Anniversary. A model of a Special Operations Unggoy for Halo 2: Anniversary. Special Operations Unggoy are deployed to a gas mine. A Special Operations Unggoy with a plasma rifle in Halo 2: Anniversary. A Special Operations Unggoy with a Special Operations Sangheili. ↑ Halo: The Flood, page ? ?